GT Omega EVO XL ▷ Size & Buying Guide on GOTURBACK.UK! The first thing to bear in mind is that the GT Omega Evo XL chair is not going to break nay ground in the world of gaming accessories. But this isn’t necessarily a bad thing if you just want a sturdy chair. While it does not come packed with exciting special accessories, it does exactly what it’s supposed to. In this case, you get a comfortable, padded gaming chair – no frills. This chair has everything you’d need from a basic package if you don’t want to splash out on one of the fancier options out there. While this is the more spartan of the GT Omega line of gaming chairs, it still has some worthwhile things to offer. The chair has a strong aluminium base and is padded with good quality cold-molded foam under faux leather covering. It also offers 4-D armrests and lumbar pillows. A good gaming chair is important, if not entirely transformative, to your game play and this is a pretty solid choice in the lower price-range. All in all, I would say that while this is not a luxurious gaming chair you’ll pass on to your grandkids as a family heirloom, it won’t break the bank either, and you’ll get many good hours of comfortable gaming out of it. While the Evo XL isn’t very fancy in terms of features, if does have a sleek, attractive design, with synthetic leather in black or white, and nylon panels in a varied choice of colours. More importantly, its aluminium base and steel frame mean that it is steady and nicely grounded, so you won’t feel shaky leaning back or moving around in it. The casters are durable and easy to move around. The Evo XL also offers excellent head and shoulder support, thanks to the lumbar pillows and ergonomic, orthopedically friendly structure. The base and 4-D armrests are adjustable, and the height can be adjusted as needed (with a class 4 gaslift). There is a 85-160 degrees reclining adjustment, with locking function. The chair weighs 33kg and measures 40 x 95 x 76 cm, so it is reasonably light and easy to move. Like other GT Omega chairs, the Evo XL model comes in a variety of colour combinations to appeal to any taste and home décor. The faux leather comes in black and white, and the soft nylon panels provide an attractive colour contrast to the leather. You can choose between solid black; black with green; black with blue; black with white, black with red, black with yellow, black with orange, black and pink, and white with black.The silver aluminium star base also adds a touch of sophistication to the chair. This model does not come with any accessories, but as previously mentioned, it does come with height adjustment, and adjustable base and armrests (up or down, backward or forward, toward or away from you), which should help you personalise it to your preference. If buying the self-assembly version, it comes with the necessary bolts, allan keys and screw driver. The Evo XL is sturdy and designed to bear a load capacity between about 75kg and 100kg. The height is ideal for tall people between 1.80m and 1.95m, with a tall, supportive backrest. If you happen to fall within this range, it should suit you perfectly with a few minor adjustments. If you would prefer something roomier, you might want to look up a few of the other GT Omega models on the market. 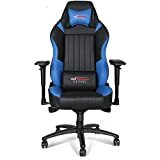 This is a well made, comfortable chair, offering the firm support needed to take you through many satisfying hours of gaming.